My wife, Christina, and I are avid cruisers, there is no doubt about it. She introduced me to cruising shortly after we met, and we have been addicted ever since. The term “working to cruise” comes to mind and it isn’t uncommon for us to be sitting on a ship brainstorming on where we are going to cruise next. When Christina told me that she was pregnant with our daughter I would have to say that was one of the happiest days of my life, but the overwhelming realities that accompany hearing that you are about to become a dad start to sink in too. One of those realities, I admit, was a tad shallow – how will this affect my cruising lifestyle? 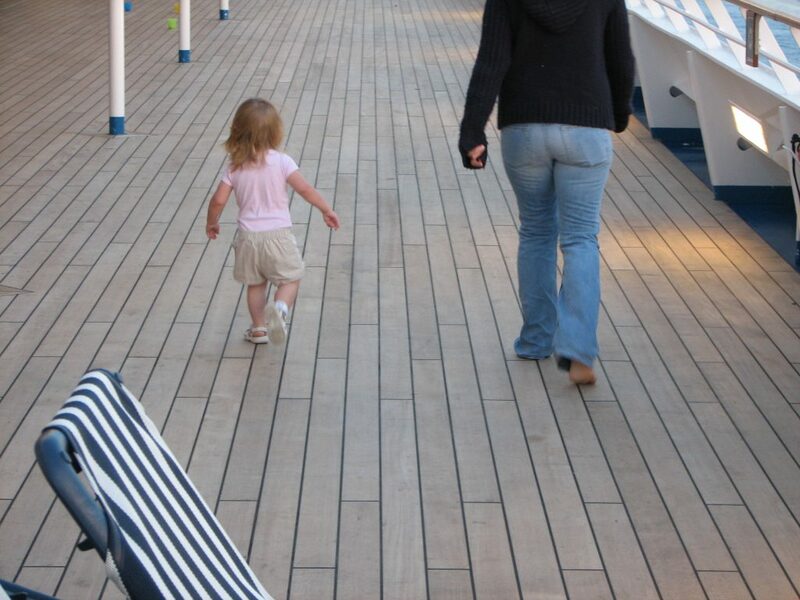 Walking on cruise deck with a toddler. Our daughter was born in December and by July we were back on a ship. You ask yourself a million questions before the trip, how will flying with your child be (those stories in a follow-up article), what do I pack, what if they cry the entire time, WHAT HAVE I DONE!? This is the part where you need to calm down, plan ahead, and learn to take advantage of the many opportunities that cruising has not only for you, but for your children as well. When trying to answer that most difficult of questions – “what do I pack for my toddler?” try to think about your everyday travel pack. In my experience the smaller the child, the more baggage you seem to carry around with you on the smallest of errands. 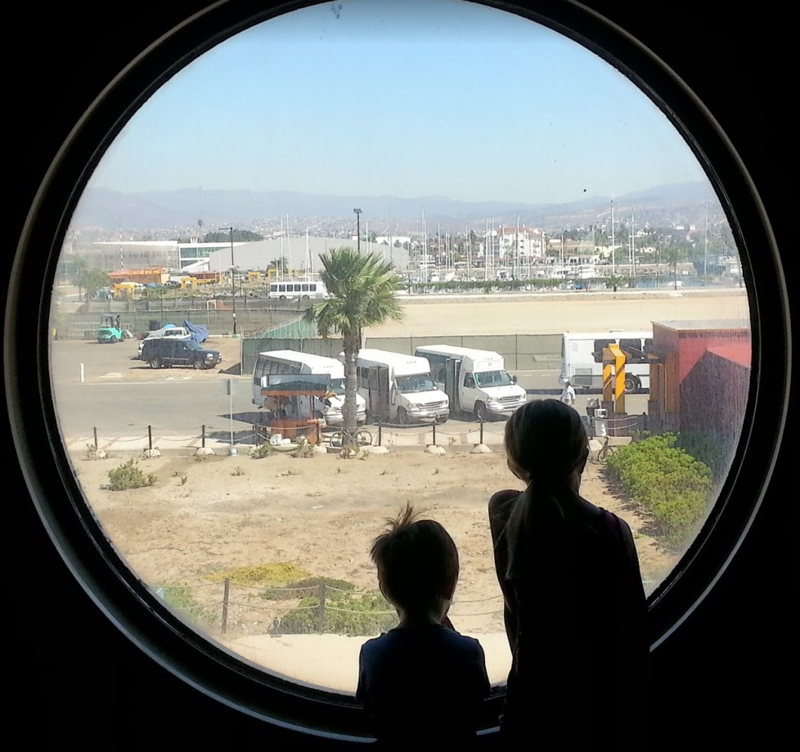 Kids looking out the cruise ship porthole in Ensenada. Whether it is diapers, formula, wipes, etc, all of those things that you use every day will be needed on your cruise. Be sure to remember to multiply your normal supplies by the number of days of your cruise, including any travel days and a day or two buffer to be safe. Most cruise lines will ask you to supply your own diapers, so be prepared! It is unlikely that your child has a driver’s license yet, but a passport is possible and recommended for any out of country travels. If you haven’t gotten them a passport yet, be sure to review the documentation requirements for travelling with children. Typically, a birth certificate will suffice, but triple check to be sure. Don’t worry about bringing your own crib. The cabin stewards will typically already have one set up in your room upon arrival. If not, don’t hesitate to ask for one. This cuts down on a lot of unnecessary luggage that you don’t need to haul around with you. Cruise ship cabin with crib. 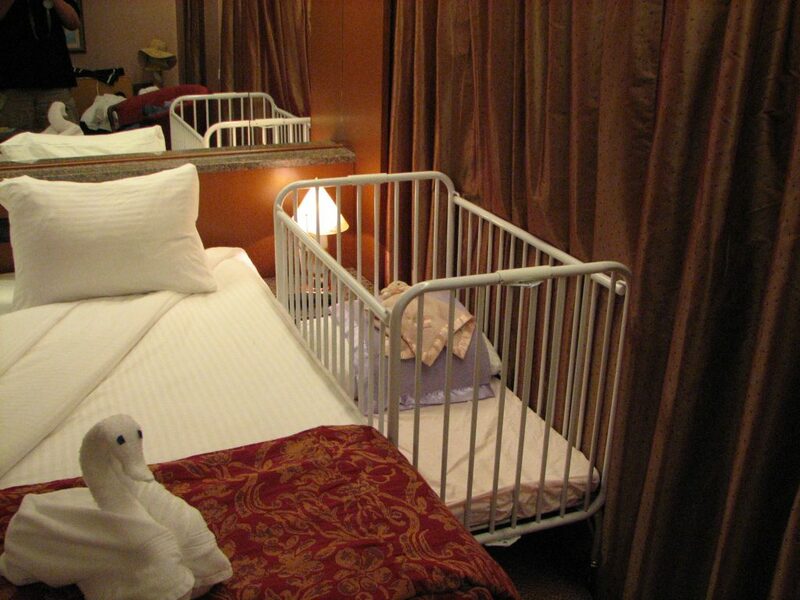 Remember that most cruise cabins trend on the smaller side though, so you may have to use a little creativity navigating around the room with the crib in place. Most likely this won’t be your cabin steward’s first rodeo though, so they will do their best to maximize the space in your room. Pro Tip – utilize the space under your bed! It is generally a great space to store your suitcases, fold up stroller, and other bulky items to free up your cabin floor space and be able to use your closest for clothes instead. Now we get to one of my favorite features of cruising with kids – the kid’s clubs! On our first cruise with our toddler, we were overcome with guilt at the idea of leaving our kid at a club while we enjoy the ship. It just didn’t seem right or fair to our daughter. However, after a short orientation (don’t skip this) with the kid’s club director on the first night we quickly realized how much fun she was going to have. In fact, we spent a good amount of time then, and many cruises since, lamenting on how cool it would have been if we had that opportunity when we were kids. Skip the guilt and trust me when I say that your kids will love it! They get to make new friends, do amazing activities, play video games, and the older kids even get to do scavenger hunts. That first night orientation will give you the lowdown on what you need to provide for your child, hours of operation, activities for their age group, etc. 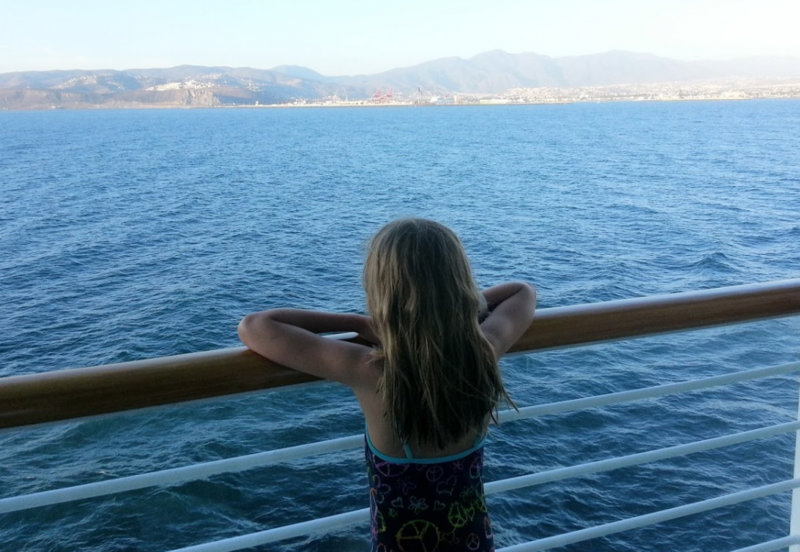 Each cruise line has their own idiosyncrasies when it comes to ages and pricing, but typically we have found that children two and over do not have a cost associated with them. Is There a Fee For Kids Club? Younger kids do usually incur a nominal hourly charge for entertaining and caring for your little one, but in our experience, it is definitely worth it even for a few hours of adult time. And most clubs will provide you with a cell phone so that they can reach out, or you can reach them, at any time if something is needed. One last thing to point out about the Kid’s Club – they are great for port days! Let’s face it, a quiet day on a sunny beach or a rum tasting in Jamaica sounds great right about now. The kid club is a great alternative for those port days where you want to go and do a little exploring on your own while the kids have fun back on the ship under the safe supervision of the camp directors. Looking over the cruise ship railing. Depending on your cruise destination, pools, waterslides, and fun in the sun are sure to top the to-do list. Don’t forget a bathing suit for your little one, however, keep in mind that most cruise lines have restrictions on very young children being in the main pools, even with “swimmy diapers” on. It is understandable and is for the overall health and sanitation of the pools, but that doesn’t mean you and your kids can’t enjoy the water. 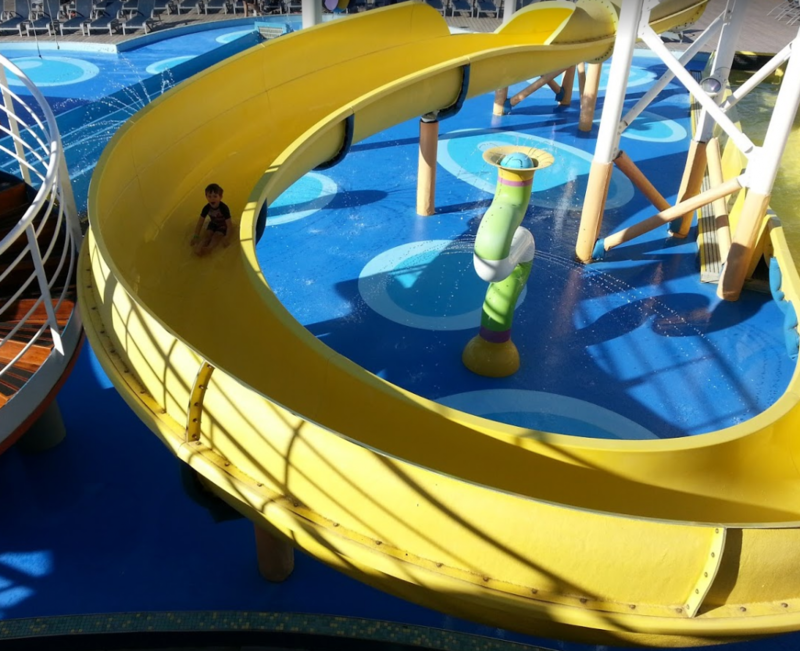 Check with your travel agent before booking to see if the ship you are on has a kiddie pool or even a waterpark area full of small slides, water spouts, and general fun water play for kids of all ages. Most newer ships will have at least one or the other. Do remember to bring lots of sunblock and reapply throughout the day to protect against sunburns. Kids enjoying the water slide on a Disney cruise ship. Whereas our daughter was as easy peasy as possible when it came to meals, the same cannot be said for our son. He is the epitome of a picky eater and even on a cruise ship loaded with a variety of foods we had challenges on our first cruise with him. 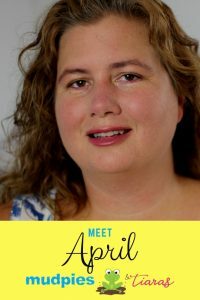 Of course, when they are still breastfeeding or on formula or baby food it is not so bad, but once they start eating “regular people food” you need to figure out how to work with your fussy eater. Fortunately, there is a wide range of food available, and though most kids would love to exist off the ice cream machine for the entirety of the cruise, that just wouldn’t be healthy. So, think about any food challenges that you encounter at home as they will for sure follow you on vacation. Most kids, including mine, will find something that they will like. Sometimes that difficult part is getting them to try it first. That is where a cruise really shines for parents with picky eaters – there are so many options that are included in the cruise fare that it gives parents and kids alike the opportunity to really sample things that they would never try on land. Encourage your kids to be adventurous and they may be trying some escargot before you know it. 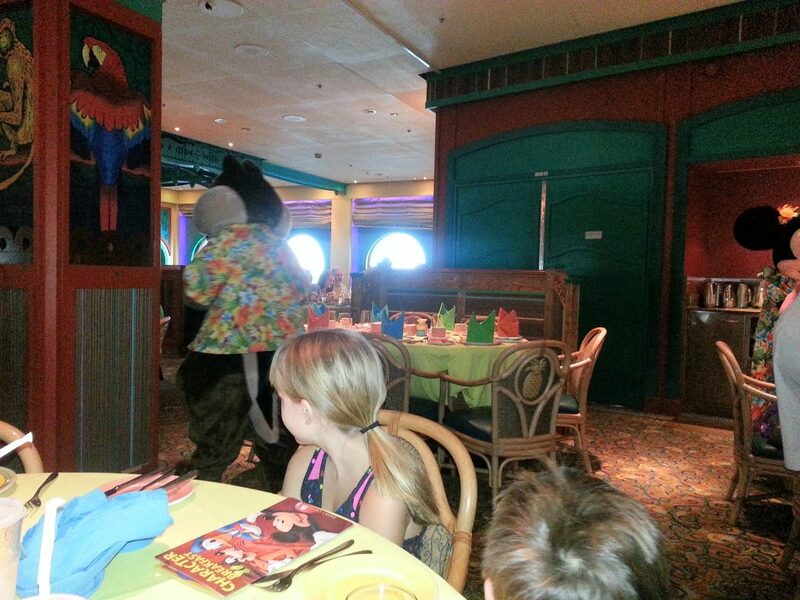 Watching characters in dining room on a Disney cruise. That topic leads us to dinners with toddlers. A lot of this comes down to personal preference, the overall temperament of your child, and your normal routine at home. For us, we love eating in the main dining room on the ship. The experience, the food, and the waitstaff really add to the vacation ambiance. But there are times when grabbing a quick meal on the Lido deck (buffets) or enjoying a date night at one of the specialty restaurants is what the doctor ordered. This is once again where the Kid’s Club will save the day. Children are always welcome in the dining room, though I would recommend an early seating if you intend to bring your child simply for the fact that most late dining options don’t even start until after 8 PM. Communicate with your little one and see what they prefer each night, you will likely find that they want to go and enjoy dinner with their new friend’s at the Kid’s Club which is typically an area on the Lido deck set aside specifically for the children to eat pizza, fries, or the all-time favorite of chicken nuggets. Should You Go Cruising with Your Toddler? Toddler looking out cruise ship balcony. Taking your toddler or small child on a cruise can be an amazing experience. Our children have been on more cruises than I care to admit, and they are still so excited when we talk about booking our next adventure. Take the time to plan your trip, investigate the opportunities that each cruise line, and even each ship, has to offer and most importantly view your cruise vacation with your children as a great time to disconnect from the hectic schedule that most of us endure on a daily basis. I think you will find, as we did, that we couldn’t imagine cruising without our little ones anymore. Tony Gardner is a cruising aficionado that has spent over 300 days at sea. He loves cruising with family & friends and sharing those experiences with others to introduce them to the adventures of cruising.